Show Classic Menus and Toolbars on the Ribbon of Microsoft Access 2010. All new features of Access 2010 have been added into the software. You don\'t need any training or tutorials if you used Access 2003/XP/2000 before. 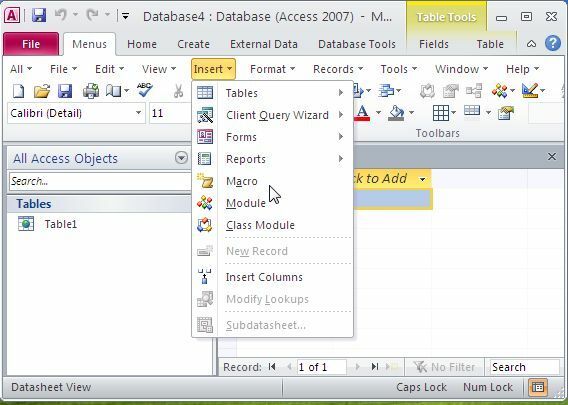 Classic Menu for Access 2010, an Access add-in designed for Microsoft Access 2010, brings the menus and toolbars of Access 2003 into the Ribbon of Microsoft Access 2010, and allows you to work with Access 2010 as if it were Access 2003. Addintools added all new features of Microsoft Access 2010 into the classic style interface. Supports all languages that are supported by Microsoft Access 2010.